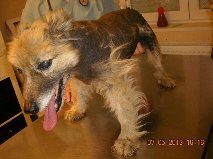 Male Adult Rescue Dogs for Adoption: ALFONSO 6 -7 year old male terrier cross in desperate need of a loving home. 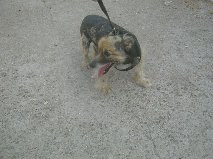 ALFONSO 6 -7 year old male terrier cross in desperate need of a loving home. Alfonso's story spreads over several years . He lived clandestinely inside a Motor Company plant although the management strictly forbids employees to feed dogs on the premises of the plant . But Alfonso and some other dogs had their protectors among the workers and they managed to hide him many times when dogcatchers were caught to round up the dogs . But his protectors could not "extract " him ouside the plant to take him to a vet although it was obvious that the hair loss ( alopecia ) he suffered from aggravated over the years . 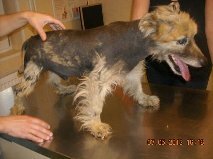 It was only after he eventually got caught and taken to the public shelter that we knew about him and took him in our care . It turned out that the reason for his condition is a problem of the thyroid gland called hypothyroidism . Tests performed on blood samples indicated this . His treatment consists mainly of receiving a supplement of thyroid hormone daily via oral way . Since his treatment was delayed for such a long time the skin is showing slow signs of recovery , hair growth is still feeble. Essential fatty acids in the daily diet will also contribute to the recovery . Also bathing with medicinal shampoo is needed to allow normal hydration of the skin. Alfonso is ok around people as he has been used to the workers feeding him and is a friendly little boy. He will need a special owner as he has not been used to living in a family environment. Alfonso will need some one experienced and who has plenty of patience and time to give him, and to carry on with his treatment to get his fir back to the healthy coat it should be. He desperately needs a home before the harsh cold winters starts in Craiova, he needs a home where he can be shown human kindes and what love really means. Alfonso will need to learn from scratch the rules of living in a house hold. A home with no other dogs or children would be advised as there is not clear history for him, he was more than likely born on the streets or abandoned there from a very young age. If you can help this boy please contact us. He will recieve all these things if a home is found for him.